In August, I wrote 2018 on track to be fourth-warmest ever. That happened, as NASA Climate Change (yes, that's a real channel) reported yesterday 2018 fourth warmest year in continued warming trend, according to NASA, NOAA. As I wrote back in August, "About the only good news is that this year will be cooler than 2017, the second hottest year on record according to NASA." The bad news is that 2019 could be the hottest year ever because of El Nino, as USA Today's 2018 temps were Earth's fourth-hottest ever reported. 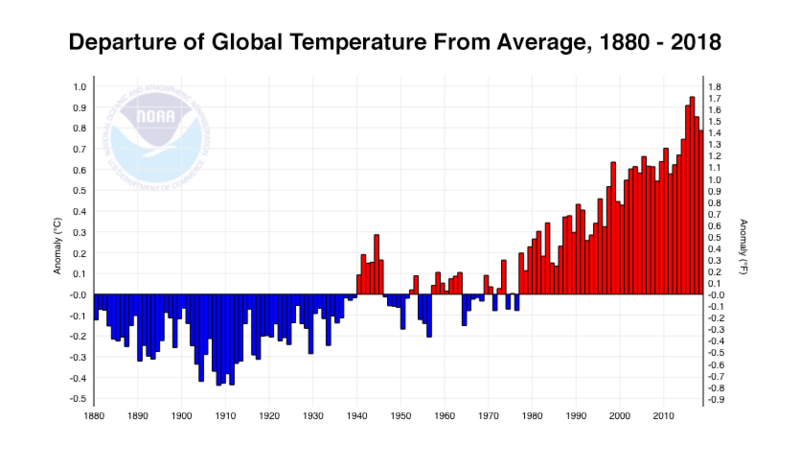 The past five years have been the warmest years since records began in the late 1800s, according to NASA and NOAA. The global temperature in 2018 was the fourth-hottest on record, scientists announced Wednesday. Only 2016 (warmest), 2015 (2nd-warmest) and 2017 (3rd-warmest) were hotter than 2018. Overall, the past five years have been the five warmest years since records began in the late 1800s, according to a report released Wednesday. Yikes! Expect more extreme weather. The silver lining might be that we will have that early spring the groundhogs forecast. Stay tuned.